PESHAWAR: During his first visit to South Waziristan, Chief Minister Khyber Pakhtunkhwa Mahmood Khan said that linking central Asia via Torkharm, Angor Adda and other points will make tribal districts a life vein of the national economy. He was addressing the tribal elders of the district on Tuesday. 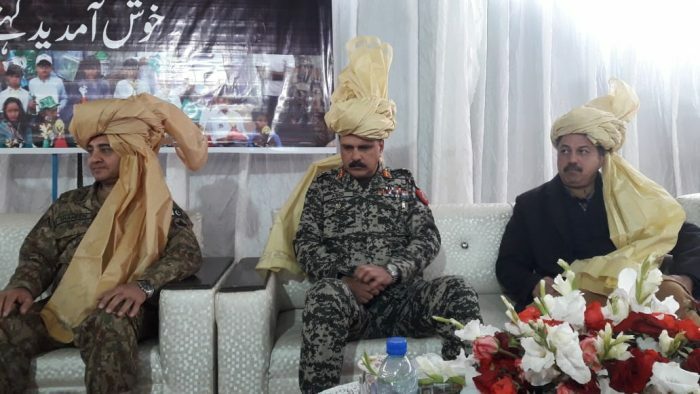 Corp Command Peshawar Lt. General Shaheen Mazhar Mahmood and Advisor to Chief Minister on new districts, Ajmal Wazir also spoke on the occasion. Chief Minister Mehmood Khan also visited Naqibullah Mehsud residence and prayed for the eternal peace of his departed soul. The Chief Minister said that people of tribal districts will be given special age and education relaxation in employment. The chief minister added all is set for local government elections which would resolve the people’s grievances. “KP government is undertaking a developmental strategy for the agriculture productivity, forest conservation, improving education, health and other social sectors services and providing employment opportunities to the youth of newly merged districts”, he further assured. “17 Thousand new vacancies have been created and another six thousand police personnel would be recruited but more importantly a good governance model and efficient services in all sectors are necessary to be in consonance with aspirations of people.” The CM revealed that the government has already sketched out a comprehensive plan and sanctioned Rs.1 billion for youth development. However, the seven new districts will get Rs100 billion annually for the next 10 years as a part of Rs1000 billion package for rehabilitation and reconstruction of seven new districts. These resources, he added, would be used in the development of natural advantages, small dams, tourism development, cottage industry and economic zone that will not only enhance the employment opportunities but would boost socio-economic development in the tribal districts. The new districts would have judicial complexes, efficient educational and health services, a university, a medical college, a teaching hospital, extension of Sehat Insaf Card to five lakh families and the overall rehabilitation of displaced people, he concluded.